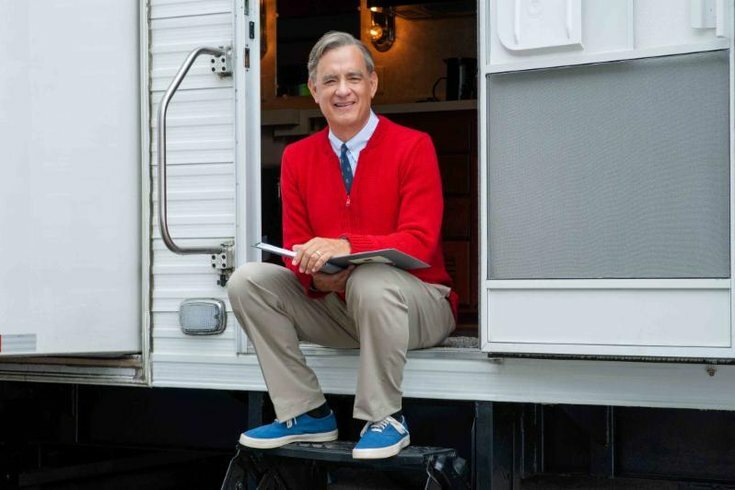 Tom Hanks, appearing here portraying Mister Rogers. Filming on the set of the new Mister Rogers movie, “You Are My Friend,” took a gruesome turn on Thursday night when a member of the sound crew fell two stories to his death. The man identified in the fall is James M. Emswiller, a 61-year-old sound mixer from Pittsburgh. Emswiller won an Emmy in 2015 for Outstanding Sound Mixing for a Limited Series or a Movie for "Bessie," an HBO original film. He was also a crew member for films such as "The Avengers" and "Jack Reacher." The movie, which is filming in Pittsburgh, was put on hold when paramedics were called around 7:30 p.m. last night. Police said the crew were filming an interior apartment scene when they decided to take a break. Emswiller stayed on the platform of the balcony during the break. Police believe it is likely Emswiller suffered a heart attack before the fall, but until they know for sure they are proceeding with a criminal investigation. By the time the medics arrived he was in full cardiac arrest. He died at 8:36 p.m. at UPMC Mercy Hospital. Tom Hanks is playing charismatic children's TV host Fred Rogers, who died in Pittsburgh in February 2003. He filmed "Mister Rogers' Neighborhood" in that city from 1968 to 2001.